A RUDN chemist synthesized nanomaterials for water purification, catalysis of organic reactions and sensors. The substances were developed on the basis of porous carbon with iron oxide and nitrogen particles. The article was published in Applied Surface Science. Multifunctional composite materials with catalytic, absorption, magnetic, and other properties can be used in medicine, the energy sector, electronics, and related applications. The best among them are materials with noble metal particles. However, they are not particularly cheap and lose their initial properties after several uses. A cost-effective alternative can be nanomaterials from porous carbon and iron oxides. RUDN chemists together with their foreign colleagues synthesized a number of such nanomaterials and studied their potential usage. To obtain a porous carbon base for the new nanocomposite materials, the researchers used an eco-friendly and inexpensive material called naringin. It is a plant pigment (flavonoid) with bitter taste that can be found in the peel of grapes, tomatoes, and citrus fruit, especially in grapefruits. To synthesize the nanocomposite materials, naringin was mixed in water solutions with non-organic iron-containing salts. Different ratios of carbon and iron precursors were tested in 17 simultaneous experiments in order to find an optimal variant. In all other aspects the procedures were identical: the solutions were carefully mixed, kept in an autoclave for 10 hours, and then calcined in a nitrogen environment. The obtained composite materials looked like black powder and contained both iron oxides and nitrogen. Iron gave them magnetic properties, and the carbon base high porosity and larger surface areas. RUDN chemists analyzed the potential of the new materials in two types of experiments. The first included the removal of organic dyes from water. The material managed to almost completely remove three different dyes—crystal violet, rhodamine B, and thionin—in 15 minutes. It turned out that the composite materials could be also reused. 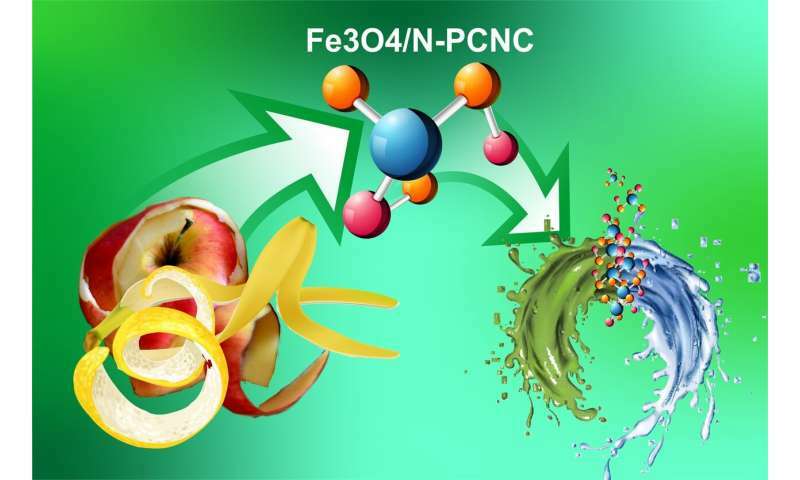 The dyes collected from the water can be easily rinsed off the nanomaterial with ethanol, and the purified composite—removed from ethanol solution with a magnet. In the second experiment the efficiency of the composite material in water purification dropped only by 3-4%. The second type of the studies was colorimetric analysis, i.e. determining the concentration of chemical substances in a solution judging by its colour. A sensor developed on the basis of the nanocomposite materials turned out to detect even the smallest amounts of hydrogen peroxide and glucose (from 0.1 mcM for hydrogen peroxide and 2.6 mcM for glucose). The catalytic activity of the composite material made the substrate turn bright blue in the presence of these substances, and colour changes were visible to the naked eye even when the sensor was tested on energy drinks and juices diluted 200 times. Like in the first range of experiments, the nanomaterials demonstrated high stability and reusability. "It is perhaps the first example in literature of such a versatile material having so many different excellent applications," says Rafael Luque, Director of the Center for Molecular Design and Synthesis of Innovative Compounds for Medicine, and a visiting scholar at RUDN. "Porous carbon composite materials with iron and nitrogen particles may be used in water treatment, quality analysis and medicine fields, unprecedented in this type of materials". The participants of the study also represented Changchun Institute of Applied Chemistry and University of the Chinese Academy of Sciences, Hefei University of Science and Technology (China), University of Gujarat (Pakistan), University of Cordoba (Spain), and University of Jimma (Ethiopia). The work was supported by the 5-100 program.